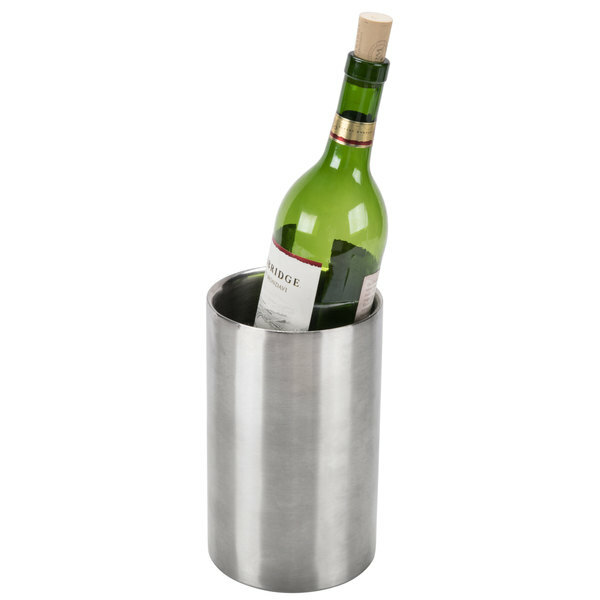 Keep wine chilled and ready to serve for up to 4 hours with the 4 3/4" x 8" double-walled stainless steel wine cooler. This brushed straight-sided stainless steel cooler holds one bottle of cold wine or champagne, keeping it chilled to a desirable serving temperature for up to 4 hours! Its double wall design provides, ultimate insulation, providing excellent temperature retention. Great for table service or self-serve wine service, this cooler has a simple yet sophisticated appeal. 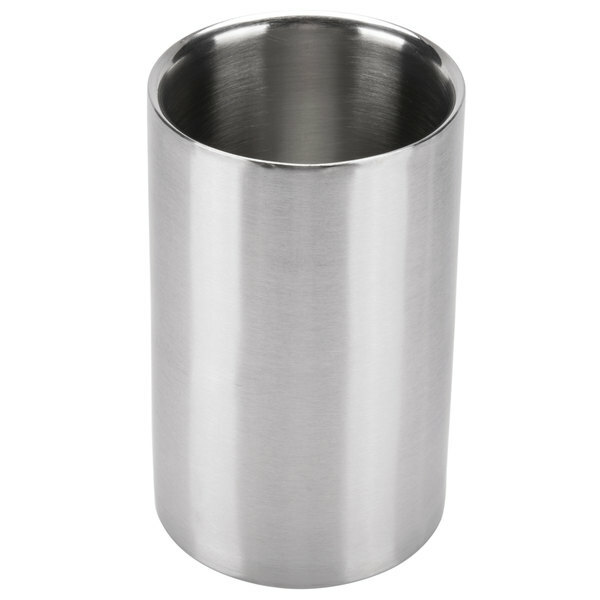 Its smooth cylinder shape and lines will delight your guests and is sure to complement the decor of your restaurant, hotel, buffet, or catered event! Its stainless steel construction is durable and sleek. Perfect for your bar, pub, or restaurant, this wine cooler is the perfect addition to your beverage service supply! These are the perfect size for 750 ml white wine bottles. Champagne bottles will not fit. Best if you place these in a cooler or freezer to stay cold. We ordered several of these wine coolers and they are a great addition for our restaurant. They are sleek and do not take too much space on the tables at the restaurant. We plan to order them again. We use these to keep our white wines chilled year round. They are understated in design and very well insulated to keep wines cool. They do the job! Very nice product. It looks good, it doesn't take that much space and it keeps the wine cool. It does it jobs, without costing too much. I recommend it. These ice coolers are amazing, they take up very little space on the table, are chic and fit in any decor. I have opened a couple of places and always buy these. I have so far been very happy with Webstaurant. The 4 3/4" x 8" Double-Walled Stainless Steel Wine Cooler arrived imperfect and Webstaurant customer service fixed the issue. Aside from what looks like manufacturer defects, the double-walled coolers are high-quality items. Functional and beautifully crafted. I love this wine cooler! I was skeptical when ordering, thinking I would receive an aluminum type product. Absolutely not!! The wine cooler is quality made with a classy finish. I enjoy entertaining with them because they compliment any event that I host! Very nice stainless steel wine coolers. They have packs inside that you can remove to chill, and makes clean up a breeze! Looks nice paired with other webstaurant bar items. This works perfectly! I just chill it at all time in the refrigerator and have it ready for use. stainless steel with no design, nor words on it just makes it feel modern, hip and sleek! This is such a pretty table piece to chill wine and it stays cold for up to 4 hours. It just makes the table setting at wine parties look so elegant. These are durable, keep wine cold and have a great look for my restaurant. The stainless has remained unscratched over time. Classy and functional product. 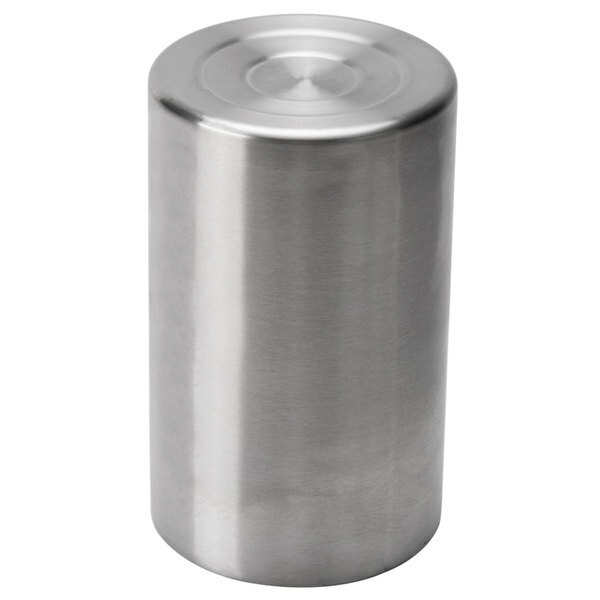 The 4 3/4" x 8" Double-Walled Steel Wine Cooler is well made and sturdy. It easily keeps wine cold and is easy to clean. It is great for gourmet restaurants and catering events. 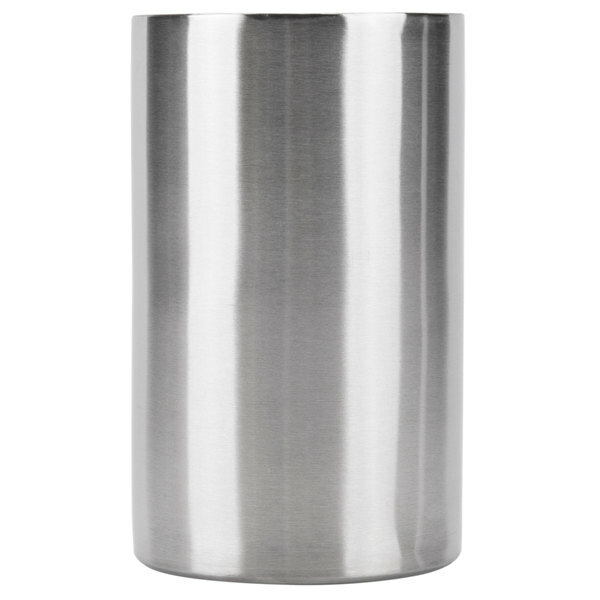 This 4 3/4 x 8 double walled stainless steel wine cooler does the job. Very pleased with it and have no complaints. Might order more in the future. In love with these! Ordered them for camping as I like my wine cold. I use them everyday at home though for whatever I am drinking, from ice water to wine to margaritas. Keeps everything cold and NEVER sweats. Will be ordering more for gifts! Not too great. They do not retain the chill nearly as well as the marble. I would suggest not wasting your money and opting for a more expensive product. Very attractive for table service. Very good value for price and manageable weight. We store in freezer for white and red wine. Will be ordering more. This keeps the wines cold and looks beautiful. You don't even have to put ice in it. It lasts for hours and does not take up any extra room on the table. This wine cooler does exactly what it should. It is large enough to fit a 750ml bottle, without ice. The double-walled sides help to insulate and retain the temperature of the bottle. Nice, clean, and simple. This stainless steel wine cooler was exactly what we were looking for, but the price was good so we were skeptical. Turns out it was perfect our needs. It chills fast, it is light weight and does not take up much room at the bar or tables. Best way to say it - Buy These!!!!! Keeps wine cold and looks very nice. They are very easy to clean and maintain. We use them daily in our bar and have been more than satisfied. This is a fabulous product. It is a low-profile cooler; doesn't take up a lot of space on a countertop or table. I ordered two and I love them. It REALLY keeps cold wine cold for hours! No more having to get up and pause the TV to go refill your glass. It'll still be at the perfect temperature. Highly recommended. I bought these for restaurant. It is really well made, smooth looking too. It is not too big so it is good for the small table. It can make a wine stay cold at least 3 hours. It just perfect. This wine cooler is very nice. It keeps the bottles of wine chilled for a couple of hours. Definitely long enough for customers to come and have dinner. We are a brewery and serve more beer then anything but when we do serve wine these these are the perfect coolers for our customers. This is the perfect item to keep bottles of wine chilled on a table for the guests. They are sleek and sharp looking. Perfect to not take up too much room on the table too! These wine coolers get used during most shifts at the restaurant and work very well. They keep the wine bottles chilled throughout the customers dining experience and are cleaned with ease. They are recommended. This wine cooler has a sleek look, small profile that's great for small tables or limited table space, and doesn't sweat. It also doesn't require ice or ice water if the wine is already to temperature, I looked everywhere for something like this before finding it on Webstaurant, and the one similar product I found was double the price. We are very happy with them! This is a great wine cooler! It keeps the wine colder longer because of the stainless steel material! Very attractive for any type of dining room!!! this is a well made wine cooler. only reason i gave 4 stars is it does not keep cool long enough while our guests always sit longer than it turns to normal temperature. The Stainless steel wine cooler has been a nice additon to our table service. We place them in the freezer at the start of dinner service and use through out the night. They are very nice looking.